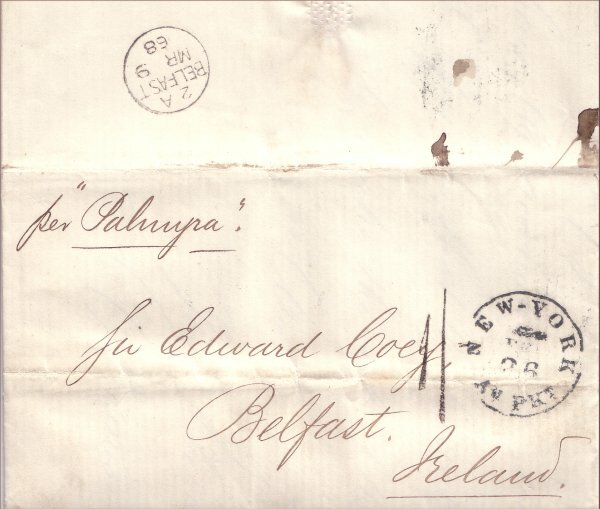 Unpaid cover sent from New York to belfast on board Cunard's 'Palmyra' on 26th February 1868. The '1/-' handstamp was applied while sorting on board the eastbound voyage. The handstamp, Robertson type M80, was issued from 1859 to Cunard (and Allan Line) ships for use on board. 'Palmyra' left New York on 26th February and arrived Queenstown 8th March 1868 on the return leg of its maiden voyage. 'NEW-YORK / FE 26 / AM PKT' on this cover. The Treaty fee of 6d for the first half ounce was introduced 1st January 1868 and applied to end December 1869. The British fine for an unpaid letter was set at 6d plus deficient postage from January 1868 and lasted until end December 1868.